Motorcycles are cool. Every man knows that. Most men want a bike not because they truly love the feel of the wind in their hair and the taste of bugs in their teeth (which is a very unsafe way to ride, FYI) but because riding one makes them feel cool. We talk about the cool factor of bikes and highlight the bikes we think are cool a lot on this site. Today, we thought that we’d share some important motorcycle safety tips. Why? Because dying is definitely not cool! Here’s how to stay safe on your bike. Your clothing is your first line of defense against the hard and terrible road if you find yourself separated from your bike. This is why riding a bike in shorts and a tank top is a terrible idea (plus, it makes you look like a tool). One of the best things you can wear is high­tensile cowhide (a special type of leather). It resists abrasions and doesn’t tear easily. During the hotter months (when even the idea of covering yourself up in cow makes you sweat), there are perforated leather and abrasion resistant mesh jackets and pants you can wear that will allow your skin to breathe while still keeping you safe. Don’t worry; you can still look sharp even while riding a bike. PRO TIP: Don’t forget to protect your feet! Don’t drive a bike in sneakers or, worse, flip flops! It’s true: there are some really awesome looking helmets out there. But what you want is not just something that looks cool, you need something that is actually safe. The first thing that you should look for is the DOT (Department of Transportation) sticker. That sticker tells you that the helmet has been put through some rigorous safety testing before being approved for civilian wear. You also want that helmet to have a snug fit. DMV.Org says that you should feel your skin move with the helmet when you wiggle the helmet around. Air vents are also important because they’ll help you stay cool. Padding, obviously, is essential, as is a durable face shield. You should also definitely get a “full face” helmet so that your whole head is protected. Have you ever looked up the statistics on motorcycle accidents? According to the Law Offices of Michael Pines, a San Diego motorcycle accident law firm, there are more than 4,000 fatal accidents that happen in the US every year. That number doesn’t even take into account the number of scrapes and minor accidents in which a motorcycle rider can be involved. This is why it is important that you take motorcycle safety classes. You need to know not just how to balance your bike, but how to operate it safely during surprising, distracting and dangerous situations. 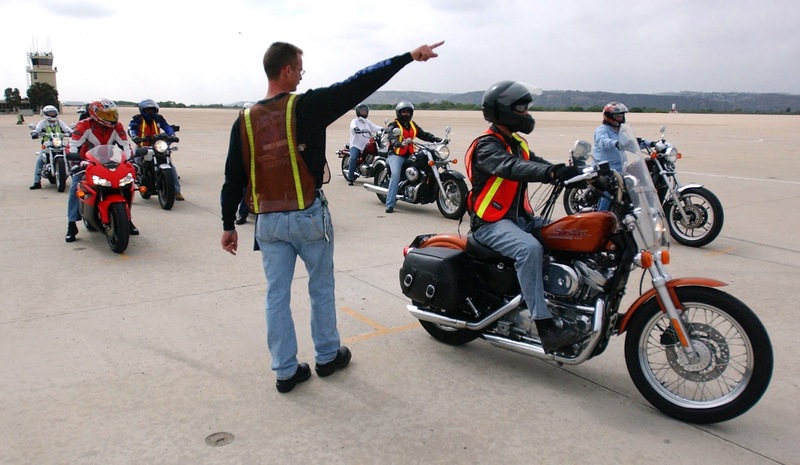 Plus, a motorcycle safety class is usually required before you’ll be allowed to get your motorcycle license. It’s tempting, once you feel the power of that bike underneath you, to push yourself to the limits or even beyond the limits of your abilities. Resist this urge! It’s true that you should challenge yourself to develop new skills (and, yes, catch up to the friends who have been riding longer than you). But you shouldn’t try to go too far too fast. Baby steps are the key to staying safe while your skills develop. Trust us on this. These are just four of the things you should be doing to keep yourself safe on that awesome bike you just bought. Remember: there is no such thing as being too safe when it comes to motorcycle operation.